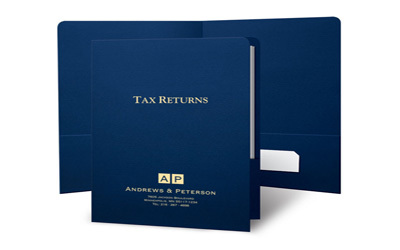 When it comes time to organize and present important tax documents, the top firms prefer top-of-the-line folders. PaperCraft’s tax folders feature a built-in concealed fastener for binding documents quickly and professionally. These do-it-yourself, easy-bind folders require no special binding equipment to assemble them which means you save on time and money. What other benefits are there to using Tax Folders? Why not just use a plain folder with a label on it? Because sensitive financial information provided to clients should look professional, secure and high quality. 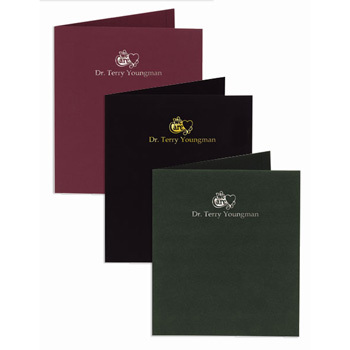 Our selection of premium cover stocks imprinted with distinctive embossing, foil stamping or multi-color printing gives it an air of importance, trust and elegance. You can’t get that from a plain, office supply folder.